We love the classic pattern on these durable dog socks. The Blue Stripes PAWks Dog Socks are blue, green, gray, and black stripes. 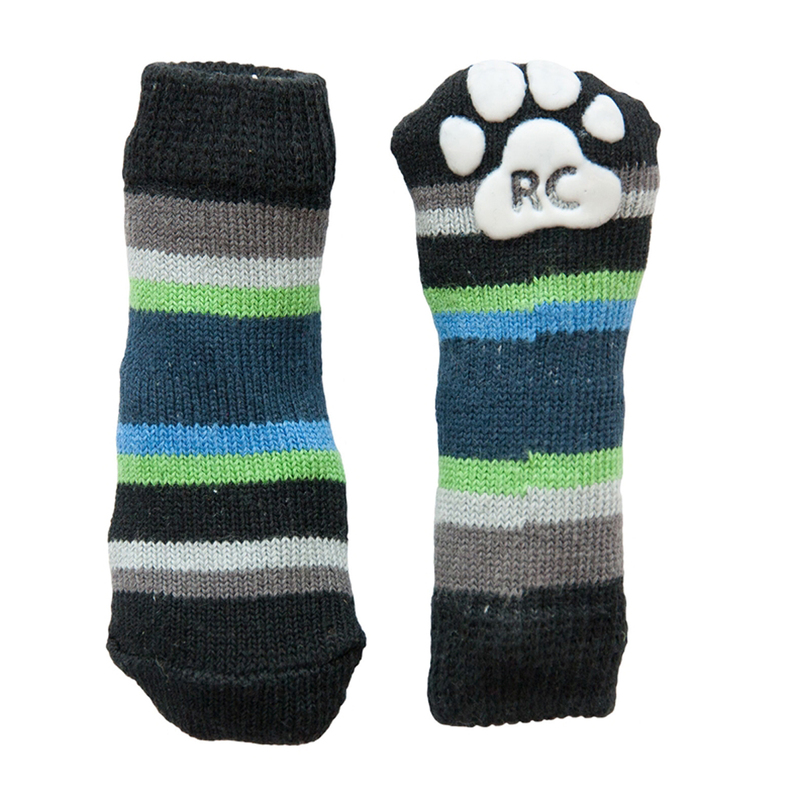 These socks feature an anti-slip paw print on the bottom. Your dog will love the new-found traction they have on slippery surfaces with these original and functional dog socks. Blue Stripes PAWks Dog Socks Customer Photos - Send us your photo! Bo loves his socks and hoodie from BaxterBoo. Posted On 08/01/17 by Stephanie S from Roanoke, VA Yes, Stephanie S recommends this product! I love them, wrested them on him and took a picture. He hates them so I returned the rest of the socks I purchased and kept these since they were on him. Great buy. Posted On 06/03/17 by Darlene E from Riverview, FL Yes, Darlene E recommends this product! I love them! Can't wait for my puppy to wear them with his matching tops!!! Very cute and well made in my opinion. Totally cute!! Perfect colors for a boy dog. Many different options to choose from in shirt colors to go with Easy to put on & easy to take off? (for the pup!) helps with protecting my hardwood floors when my Abner ?? feels like chasing the cats! Posted On 08/29/16 by Scott B from , DE Yes, Scott B recommends this product! These are great socks. Get them smaller than you think especially if your dog has a lot of hair on their feet. Their feet are smaller than they look. I only gave them 4 stars because I wish the rubber grip part was on both sides of the sock because they get twisted around and then they are not serving their purpose. Otherwise, they are so great and so cute and good quality. Live the socks, thanks Baxter! My dog loves his socks!!! I wasn't sure he would but he looks at me like, "thanks," when I put them in him!! They fit great too. Posted On 11/27/15 by Jill S from Lewisville, NC Yes, Jill S recommends this product! Love these socks. Chief has had an injury leaving him with right sided deficits, hindering his ability to walk well. With these slip-free socks, he is able to get around without slipping! Posted On 10/10/15 by Chris H from Charlotte, NC Yes, Chris H recommends this product! These are the best quality of socks you can get for your pet. Had to try all sizes to get the best fit. Large for front feet and medium for back since his feet are different sizes.